In October 2014, the Kingdom of Bahrain Ministry of Interior (Nationality, Passport and Residence Affairs) introduced an e-Visa system that allows nationals from over 100 countries to obtain a visa online. In February 2016, Bahrain introduced e-Visas to visitors from eleven African countries, marking the third phase of the Kingdom’s new visa policy. The e-Visa system is an online method of applying for visas for entry from anywhere in the world. This e-Visa allows travelers to apply quickly over the Internet at any time from any location and pay easily online at the time of the visa application. Once your application is approved, we recommend you print a copy of the document to carry with you. When you arrive in Bahrain, your electronic visa will be accessible to the passport officer who greets you. A photocopy of the photo page of the applicant's passport plus a copy of the passport last page for Indian passports. A copy of return air ticket. A copy of hotel booking in Bahrain. Alternatively, in case you are staying with a relative, you must provide a copy of their CPR Reader's printout. A copy of a stamped bank statement under the visitor's name covering the last three months with an ending balance of not less than the equivalent of 800 USD. The Bahrain e-Visa is valid for 3 months from the issue date. The expiry date on the visa page is for the first entry only, after the first entry you receive the full validity period. The Bahrain e-Visa comes with multiple entries and with a maximum stay of 30 days per visit. Applicants must be outside the Kingdom of Bahrain when applying for this visa. You must enter Bahrain through the airport. 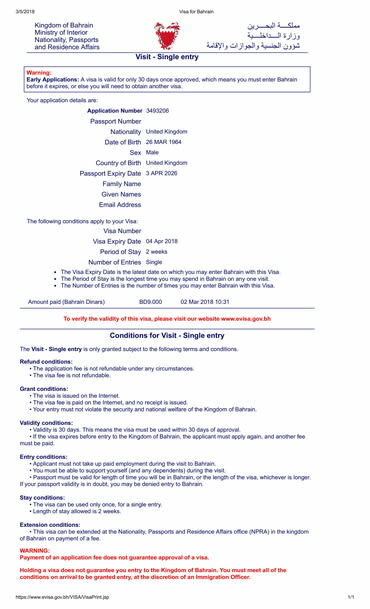 You cannot use this visa to enter Bahrain via the King Fahad Causeway. You must have a valid confirmed onward travel ticket to leave Bahrain. You must be capable of supporting yourself (and dependents if traveling with you) during the visit. The Visa Expiry Date is the latest date on which you may enter Bahrain with this e-Visa. If the visa expires before entry to the Kingdom of Bahrain, the applicant must apply again. You must have used your visa, or it needs to have expired, before you can apply for another visa. (It is not possible to have more than one visa issued for a passport at a time). The purpose of visit must be tourism, business or investment. You must not take up paid employment during your visit to Bahrain. Your passport must be valid for the length of time you will be in Bahrain, or the length of the visa, whichever is longer. What is the Bahrain e-Visa? It is an official document which provides authorization to travel to and from Bahrain and is electronically linked to your passport. What do I need to submit with my Bahrain e-Visa application? Photocopy of the photo page of the applicant's passport plus a copy of the passport last page for Indian passports. Copy of return air ticket. Copy of hotel booking in Bahrain. Alternately, in case you are staying with a relative, please provide a copy of their CPR Reader's printout. What is the cost to obtain a Bahrain e-Visa? The visa cost for Bahrain e-Visa is 79 USD. Additionally, there is a service fee of 35 USD which includes the standard processing. For rush processing and super rush processing the service fee is 65 USD and 100 USD, respectively. How long does it take to process a Bahrain e-Visa? How long is the Bahrain e-Visa valid for? The Bahrain e-Visa is valid for 3 months from the date of issue. However, it must be used within 30 days of issue, or it will become invalid. What conditions must the applicant’s passport meet for the Bahrain e-Visa? Your passport must be valid for length of time you will be in Bahrain, or the length of the visa, whichever is longer. Also, it should have at least one blank page. Who is eligible for Bahrain e-Visa? Citizens of certain countries are eligible to apply for the Bahrain e-Visa provided that they meet the required criteria. Scroll to the top of the page and use our Visa Checker to determine the visa requirements for your country. How many entries do I get with the Bahrain e-Visa? The Bahrain e-Visa allows you multiple entries, but note that each entry is limited to 30 days. How long can I stay in Bahrain? There is a maximum stay of 30 days per visit. Note that British and Irish nationals can stay up to 3 months (90 days). Can I apply for the e-Visa in Bahrain? No. The Bahrain e-Visa must be obtained prior to your entry into Bahrain. How does the Bahrain e-Visa work? The Bahrain e-Visa allows the holder to travel to Bahrain as many times as desired, within the validity period which is 3 months from the date of issue. The maximum length of each entry is 30 days. Do I need to enter Bahrain on the exact date specified in my e-Visa application? The validity period of your Bahrain e-Visa begins from the date specified in your approved e-Visa document. You can enter Bahrain on any date within this validity period. If I already possess a valid Bahrain e-Visa, can I apply for a new e-Visa again? A new e-Visa cannot be obtained using the same passport until your current e-Visa expires. If you lose the passport which contains the current and valid e-Visa, you may apply for a fresh Bahrain e-Visa by paying the relevant fee again. How do I know if my Bahrain e-Visa is still valid for travel to Bahrain? If you have applied for the Bahrain e-Visa, you can inquire through this site to find out its current status. You will need to log in in order to make this inquiry and renew your e-Visa if necessary. What are the conditions for being granted Bahrain e-visa? In order to apply for another visa, you must have used your previous visa, or it needs to have expired. Is it possible to extend my e-Visa to stay longer in Bahrain? Yes, visit the NPRA (The General Directorate of Nationality, Passports & Residence) for more info once you are inside Bahrain. What should I do if my Bahrain e-Visa application is not approved? We will notify you via email if your application was not approved. If this happens, you have to contact the nearest Bahrain embassy. A visit to Bahrain requires you more than packing a bag. Chances are that you need to take care of the proper documentation before you leave so that you can cross the border. Otherwise, you will not even be able to board your flight. Lucky for you, Bahrain does not have one of those strict visa policies and you have options. There are four categories of travelers as far as that policy is concerned, and it all depends on your country of origin. If you are lucky, you are visa exempt or can get a visa once you arrive in the country. The first category of travelers is represented by visa-exempt nationals. Every single country in this world has such a category. As a result of treaties and accords, some states allow their citizens to cross each other’s borders with nothing other than a passport or even a simple national ID card. Although the list is always limited and some conditions may apply, the rules are pretty straightforward for Bahrain. It seems that only the citizens of Kuwait, Oman, Saudi Arabia, and the United Arab Emirates are allowed to cross the border to Bahrain without a visa. All they are required to have is a national ID card. The second category of travelers can apply for a visa online or get one once they land in Bahrain. Basically, these nationalities enjoy an either/or kind of situation in which they can choose from a visa on arrival or an electronic visa, whichever seems to be the most convenient at the time. If you belong to this category, you should know that you have your work cut out for you. As you may have noticed, getting whichever of the two is very simple. Of course, we recommend the electronic visa because the online process is a lot easier than standing in line at a counter, but it depends on your preference. Most of the nationalities in the world belong to this category of travelers, and most of them prefer the electronic visa because it takes very little time and effort. It is perfectly understandable. You can apply from home and get your visa in just a couple of days. The documents, both electronic and visa on arrival, grant you a 30-day stay inside Bahrain. The only exception is for Irish and UK citizens who are allowed to stay for 3 months. Even so, 30 days is more than enough given the fact that the application process is close to non-existent. That how easy it is. The third category of travelers is represented by people who have access only to an e-visa. There are 33 nationalities who have the option to get a visa is to apply online. Of course, they could also go to an embassy, but it is not worth it for short stays. That is because the electronic visa for this category of people grants only a 14-day stay. Even so, 14 days is more than enough for a vacation, a visit, or a business trip. The last category includes all the other nationalities who do not have access to any of the documents above. Most of them are from Africa, but there are a few from Asia and Europe. If you belong to this category, your only option to visit Bahrain is to go to an embassy. You cannot apply online or get a visa on arrival. As a result, you need to take a trip to the nearest consulate and apply for your visa there. Applying at an embassy for a visa is not a picnic. You need a few documents, you need to deal with government forms, and you need to wait for a while to get your visa. As for the required documents, you can use the internet to do some research, but you should use the information you find as a reference only. We advise you to contact the embassy itself and inquire there about what it is necessary for your application process. That way you can avoid taking a trip only to get there and find out that you do not have everything you need or you have the wrong documents. It is best if you are thorough so that you do not waste time and money. You probably do not know this, but Bahrain has reformed its visa policy in the recent years. The government kept making changes in 2014, 2015, and 2016. It was all for the better because according to statistics, the number of applicants grew considerably. All it meant was that the new policy was working and more and more people came to Bahrain. We all know that tourism is a significant part of a country’s economy, which is why every single state should make the visa application process as simple as possible. That, of course, already happens with most countries. Of course, a trip to Bahrain entails more than reading about the visa application process and categories of travelers. When you visit a new country, you should always do your homework. While the required documents will help you enter the country, there is a need for some extra information that will make your stay pleasant and fruitful. It does not hurt to read about their culture, habits, traditions, what to do and what not to do, culinary habits, and the list can go on. It is essential to respect the Bahraini’s way of life, especially since the country is mostly Muslim. As you can see, getting into Bahrain is not that difficult. Depending on your nationality, you can get your visa at the airport, online, or at a Bahraini embassy. Either way, the best part is that you have access to one and your entrance is not restricted. No matter how you apply, keep in mind to do your due diligence so that you have a straightforward and fast application process. Otherwise, you may experience the same thing that some people go through, and that is to repeat the process over until you learn to pay attention.